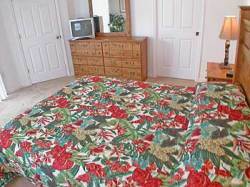 2 master beds with on suite bathrooms. Executive 4 bedrooms, 3 bathroom home with private south facing pool. 10 minutes from Disney. This executive 4 bedroom home with 3 bathrooms built in 2001 is situated on the prestigious Eagle Ridge development & completely refurnished in 2005 to a high standard. This home has the luxury of two master bedrooms with en suites and patio doors that lead straight out onto the pool deck, there are two further bedrooms with a bathroom situated between them. Relax in the open plan luxury furnished lounge with its vaulted/cathedral ceilings. 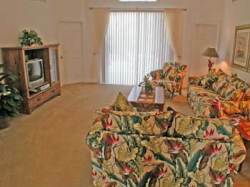 The 3 seated sofa, 2 seater love seat and chair have been made with bird of paradise material which gives you that Florida feel which blends perfectly with the oak furniture to include your entertainment centre comprising of cable TV with video and DVD player, The lounge also has patio doors that lead onto the pool and deck area. There is a fully fitted kitchen with all the appliances that you will ever need like the American style fridge freezer with its own ice making machine for those cool drinks. A dishwasher, microwave and cooker plus all the kitchen gadgets and utensils that you could ever imagine and would expect to find in a home of this quality. The dining area will seat six in comfort, great if you want to entertain guests and friends in a formal dinning area, there is also a breakfast bar with bar stools for four people. Or if you prefer to dine out all the major restaurants and attractions are only a short drive away. 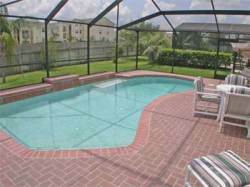 The south facing private pool is not overlooked & enjoys the best of the Florida sun during the day with magnificent sunsets in the evenings, So when you have had a busy day out, what better way to relax than to come home to your own private pool with it's under water illumination or relax on the luxury pool loungers in the evening sun and watch the sun set, a perfect end to a perfect day. Linen, towels and hairdryers are provided for your convenience as well as a highchair and cot for young ones (no extra charge for these). A washing machine and tumble dryer with ironing facilities are here to complete your every need. The location of this house is well situated on the Eagle Ridge development which is one of the most desirable in the area. This development has some of the friendliest people you will ever come across; a large number of the residents are American who offer you a very warm welcome. Eagle Ridge also has its own golf course and is one of the best golfing courses that is available in central Florida. This 6,500 yard coarse which is kept in pristine condition and was originally designed by Greg Norman. Eagle Ridge with its tree lined main driveway is well situated within central Florida, Disney being only 10 minutes away. Wal-Mart is situated 5 minutes from Eagle Ridge and is open 24 hours a day with every thing you could need from food to clothes and gifts. Walgreen's pharmacy and Winn-Dixie food supermarket are only 6 minutes away, so everything is close at hand. This home will be a great start to one of the most memorable holidays you could ever imagine with one of the worlds greatest entertainment centres so close. 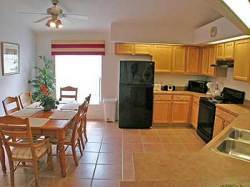 Making it the perfect place for your family to enjoy their vacation/holiday in Florida.